STAT proteins (Signal Transducers and Activators of Transcription) are a family of transcription factors that are specifically activated to regulate gene transcription when cells encounter cytokines and growth factors. 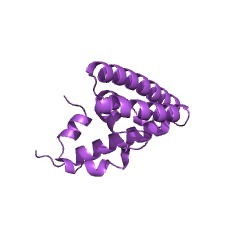 STAT proteins also include an SH2 domain. The STAT protein (Signal Transducers and Activators of Transcription) family contains transcription factors that are specifically activated to regulate gene transcription when cells encounter cytokines and growth factors, hence they act as signal transducers in the cytoplasm and transcription activators in the nucleus [(PUBMED:12039028)]. Binding of these factors to cell-surface receptors leads to receptor autophosphorylation at a tyrosine, the phosphotyrosine being recognised by the STAT SH2 domain, which mediates the recruitment of STAT proteins from the cytosol and their association with the activated receptor. The STAT proteins are then activated by phosphorylation via members of the JAK family of protein kinases, causing them to dimerise and translocated to the nucleus, where they bind to specific promoter sequences in target genes. In mammals, STATs comprise a family of seven structurally and functionally related proteins: Stat1, Stat2, Stat3, Stat4, Stat5a and Stat5b, Stat6. STAT proteins play a critical role in regulating innate and acquired host immune responses. Dysregulation of at least two STAT signalling cascades (i.e. Stat3 and Stat5) is associated with cellular transformation. Signalling through the JAK/STAT pathway is initiated when a cytokine binds to its corresponding receptor. This leads to conformational changes in the cytoplasmic portion of the receptor, initiating activation of receptor associated members of the JAK family of kinases. The JAKs, in turn, mediate phosphorylation at the specific receptor tyrosine residues, which then serve as docking sites for STATs and other signalling molecules. Once recruited to the receptor, STATs also become phosphorylated by JAKs, on a single tyrosine residue. Activated STATs dissociate from the receptor, dimerise, translocate to the nucleus and bind to members of the GAS (gamma activated site) family of enhancers. 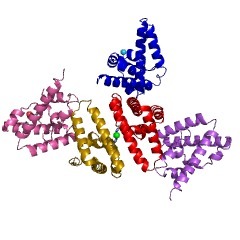 The seven STAT proteins identified in mammals range in size from 750 and 850 amino acids. The chromosomal distribution of these STATs, as well as the identification of STATs in more primitive eukaryotes, suggest that this family arose from a single primordial gene. STATs share structurally and functionally conserved domains including: an N-terminal domain that strengthens interactions between STAT dimers on adjacent DNA-binding sites; a coiled-coil STAT domain that is implicated in protein-protein interactions; a DNA-binding domain with an immunoglobulin-like fold similar to p53 tumour suppressor protein; an EF-hand-like linker domain connecting the DNA-binding and SH2 domains; an SH2 domain (IPR000980) that acts as a phosphorylation-dependent switch to control receptor recognition and DNA-binding; and a C-terminal transactivation domain [(PUBMED:9630226)]. The crystal structure of the N terminus of Stat4 reveals a dimer. The interface of this dimer is formed by a ring-shaped element consisting of five short helices. Several studies suggest that this N-terminal dimerisation promotes cooperativity of binding to tandem GAS elements and with the transcriptional coactivator CBP/p300. 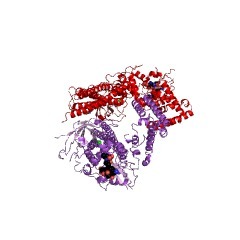 This entry represents the N-terminal domain, which is responsible for protein interactions. 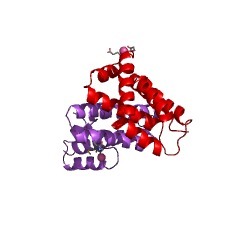 This domain has a multi-helical structure that can be subdivided into two structural sub-domains. There are 2132 STAT_int domains in 2121 proteins in SMART's nrdb database. Taxonomic distribution of proteins containing STAT_int domain. This tree includes only several representative species. The complete taxonomic breakdown of all proteins with STAT_int domain is also avaliable. Click on the protein counts, or double click on taxonomic names to display all proteins containing STAT_int domain in the selected taxonomic class. Three-dimensional structure of the Stat3beta homodimer bound to DNA. STAT proteins are a family of eukaryotic transcription factors thatmediate the response to a large number of cytokines and growth factors.Upon activation by cell-surface receptors or their associated kinases,STAT proteins dimerize, translocate to the nucleus and bind to specificpromoter sequences on their target genes. Here we report the first crystalstructure of a STAT protein bound to its DNA recognition site at 2.25 Aresolution. The structure provides insight into the various steps by whichSTAT proteins deliver a response signal directly from the cell membrane totheir target genes in the nucleus. Structure of the amino-terminal protein interaction domain of STAT-4. STATs (signal transducers and activators of transcription) are a family oftranscription factors that are specifically activated to regulate genetranscription when cells encounter cytokines and growth factors. Thecrystal structure of an NH2-terminal conserved domain (N-domain)comprising the first 123 residues of STAT-4 was determined at 1.45angstroms. The domain consists of eight helices that are assembled into ahook-like structure. The N-domain has been implicated in severalprotein-protein interactions affecting transcription, and it enablesdimerized STAT molecules to polymerize and to bind DNA cooperatively. Thestructure shows that N-domains can interact through an extensive interfaceformed by polar interactions across one face of the hook. Mutagenesis ofan invariant tryptophan residue at the heart of this interface abolishedcooperative DNA binding by the full-length protein in vitro and reducedthe transcriptional response after cytokine stimulation in vivo.